Bring out the best in your event by tapping into the promotional opportunities on offer from a custom table cloth. Whether it's an exhibition or concert, race or motor show - table cloths will give your event the edge whilst boosting your brand as it can be printed with any logo, design or theme. 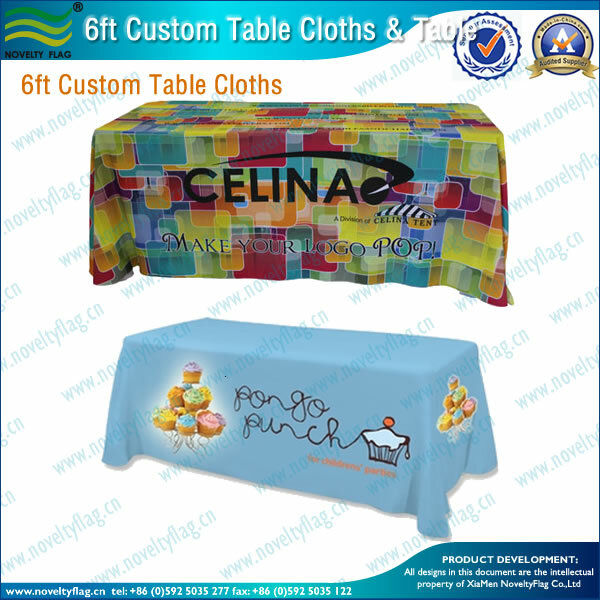 The custom table cloths are not only a practical promotional solution but they're high-quality too. Every custom table cloth is manufactured from 210gsm polyester textile which is lightweight and easy to set up. NoveltyFlag's Custom Table Cloths not only shout about your company but they can also hide brochures, samples and other items on your stand whilst giving your brand a boost. The Table Cloths are supplied ready to fit to the supplied table - simply use the vecroto secure the table cloth to the supplied table. The exhibition tables and custom table cloths are speedy to set-up and quick to dismantle, and offer simple yet effective event branding.